I think this month’s Bon Appétit Magazine may be one of my favorites. They focused on healthful foods this month. Page after page, I was just blown away and inspired by the ideas and photos. Their cover photo inspired my recent miso soup. When I paged through and landed on their Pan-Roasted Chicken with Harissa Chickpeas, my mouth began to water some more. Harissa. I love the spice paste and I have always wanted to make it myself. I knew right then that I had to veganize this dish. I also knew that I wasn’t going to use store-bought harissa. I had to make it my own. 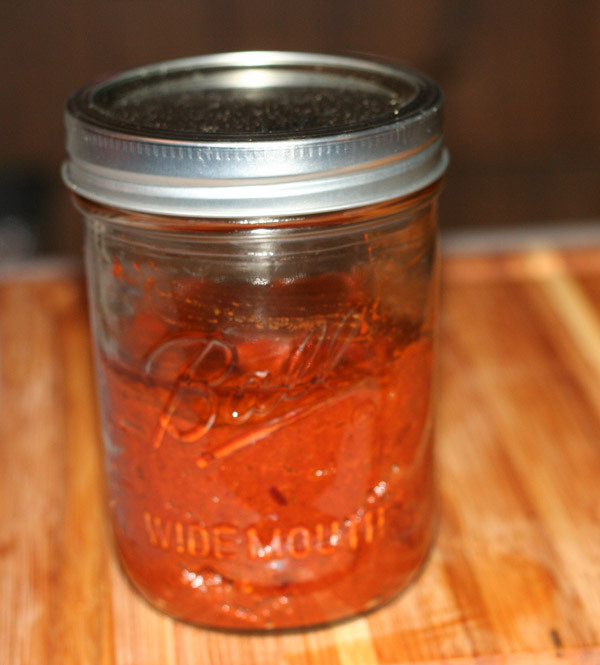 Harissa is a North African chili paste. It’s spicy and fragrant – so full of flavor. I often buy it to spread on challah for Shabbat, or I sometimes spread it on fish. I knew from past research that Harissa uses freshly toasted spices and would be the perfect opportunity to break out my new mortar and pestle. The amazing folks at Core Bamboo recently sent me a beautiful mortar and pestle that would be perfect for this Harissa job. Core Bamboo is also amazingly generous and sponsoring a giveaway for a mortar and pestle just like mine. So check out the end of this blog post if you are interested in winning a set for your own kitchen. Core Bamboo produces an amazing array of kitchen products. I think I have a cutting board addiction, and several in my collection are made by Core, as are several of my bowls. I may also hoard serving bowls. I’m a kitchen stuff hoarder. Plain and simple. Anyhow, back to the dish. First, I made the Harissa. I soaked some dried chile peppers in boiling water. While the peppers soaked, I toasted the spices in a hot pan. I then ground up the toasted spices in my mortar and pestle. Once the peppers were soft, I seeded and stemmed them and then I transferred everything to my Cuisinart food processor and blended the mixture. Everything came together quickly. Once the harissa is ready, transfer the mixture to a clean jar and add some extra olive oil to cover the paste. I then set out to make the rest of the meal. Next, I sliced my tofu and spiced it with salt, pepper and cumin. I seared the sliced tofu in a hot pan and then transferred the tofu to a plate. I sautéed some onion, garlic and additional spices. 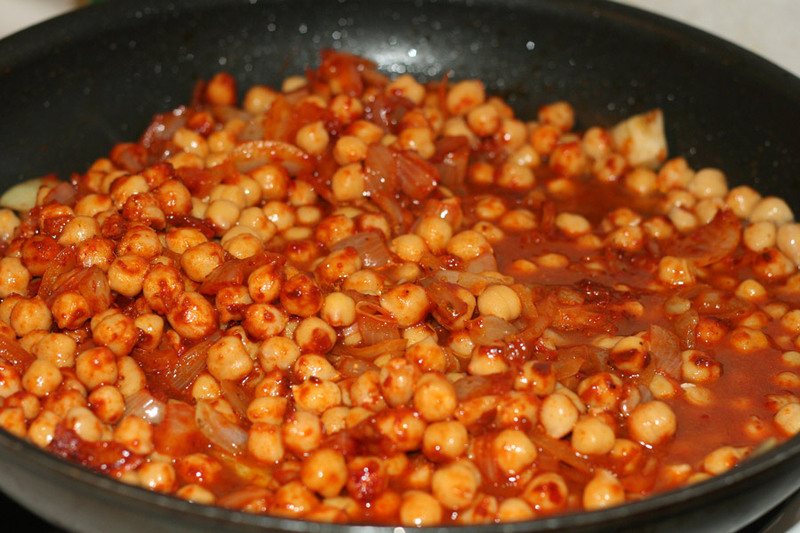 I added my chickpeas to the pan, along with some harissa, tomato paste and vegetable broth. I let the mixture cook for a few minutes. I then added the tofu back to the pan so that it gets coated with the Harissa. 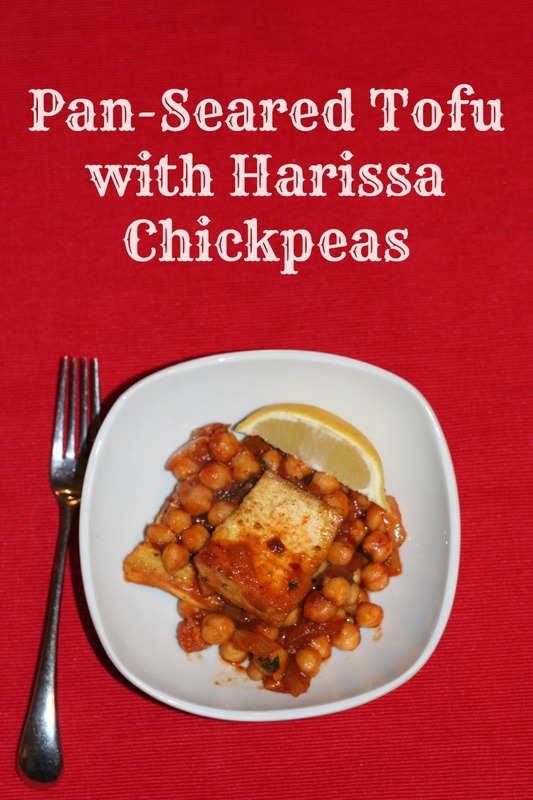 I served the tofu and chickpeas with some lemon wedges. Dinner was amazing. It was super easy to make and everyone walked away with full, happy bellies. I hope you enjoy! 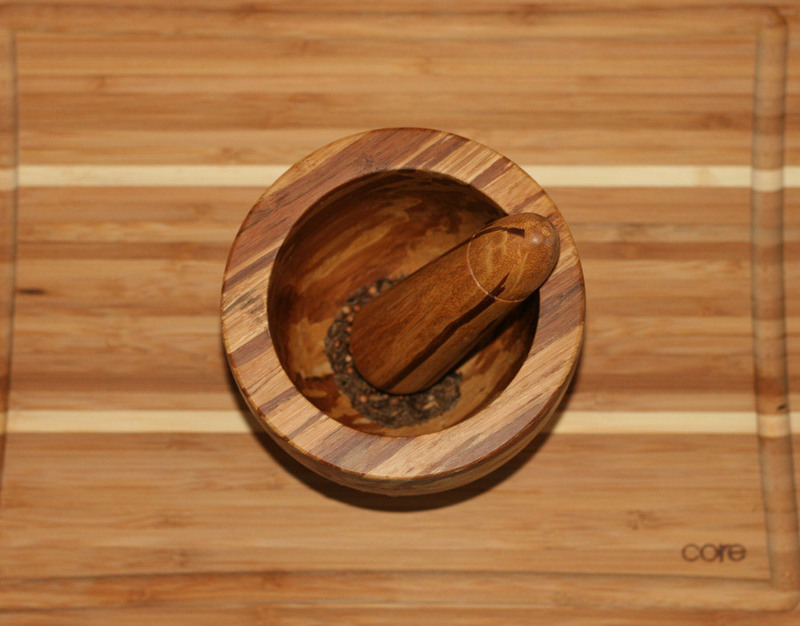 Don’t forget to enter the amazing giveaway for a Core Bamboo Mortar & Pestle! Heat oil in a large pan over medium high heat. Season the tofu slices with the salt, pepper and cumin and sear the tofu until browned on both sides. Transfer to a plate when done. Add onion and garlic to the pan and saute for a few minutes until softened. Stir in the tomato paste and add in the chickpeas and the harissa. Stir in the vegetable broth and let the mixture simmer. Let it cook for about 5-10 minutes and then add the tofu back to the pan. 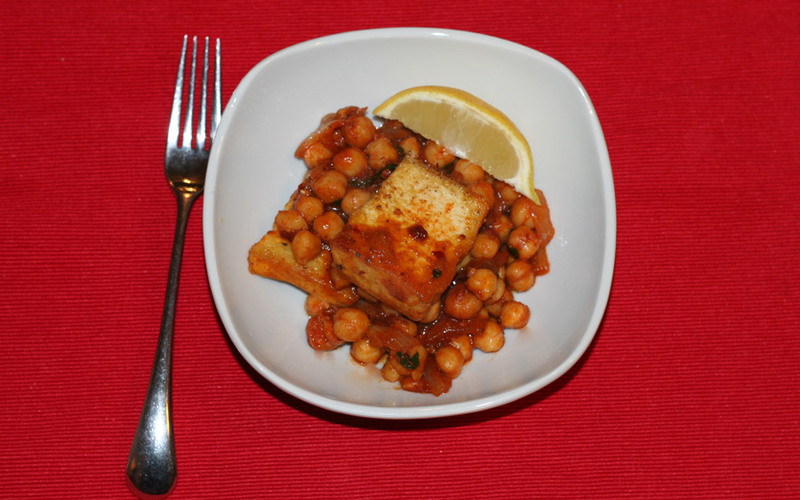 Ensure that the tofu is coated with the harissa mixture. Serve the dish with lemon wedges for squeezing over the dish. You may also like rice along side the dish. Put the chilies in a bowl and pour bowling water over the chiles to allow them to soften. Let them sit for about 20-30 minutes. In a dry pan, toast the caraway, coriander and cumin seeds over medium heat. Toast them for a few minutes until they begin to become fragrant. Transfer the spices to a mortar and pestle and grind them so that they become a powder. 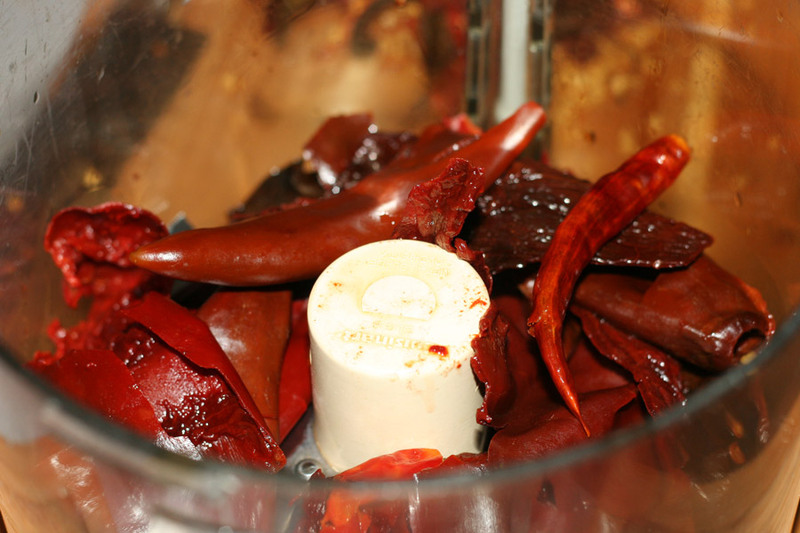 Drain the chiles and remove the stems and the seeds. Transfer them to your food processor. Add the rest of the ingredients to the food processor, including the ground spices, and puree until everything is well integrated and smooth. Store the mixture in a sterile glass jar. Add some olive oil to the top of the harissa paste and seal the jar. Store in the fridge for up to a few weeks.